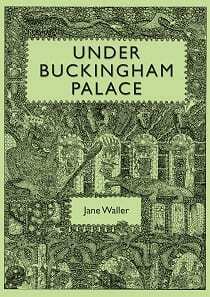 Under Buckingham Palace is the reincarnation of a now out-of-print book written by Jane some years ago, called the Sludge Gulpers. It is a delightful tale of a young girl who finds herself down in London’s sewers with a very important, dangerous journey ahead. Soon to be stocked in Waterstones and also available direct from Jane, this new book costs just £6.99. It’s perfect for children but Jane’s books are so inclusive they can be enjoyed by 8 – 90 year olds alike. And even 100 year olds! Suzie finds herself in the sewer tunnels under London, and in this strange subteranean world a group of creatures are expecting her. They are the Sludge-Gulpers, and they’ve kept their existence a secret from Humans for centuries. But now, treacherous things are going on under Buckingham Palace. The terrible Queen Greenmould is scheming to take over the complete sewer-system; and, even worse, to start interfering Up Above. And Suzie is needed to help save the Sludge-Gulpers from the foul sewer Queen, the evil Slime-Grubbers, and the ferocious army of rats. It’s a truly wonderful read and once you’ve finished you’ll want to grab one of Jane’s other books, that is if you haven’t read them already. Contact Jane to buy a signed copy direct from her.